If you’re ready to learn about Fetal Lung Development then this is the post for you. As you will see below, this study guide is loaded with practice questions that can help you learn everything you need to know about this topic. As a Respiratory Therapist, especially those who are interested in working in the NICU or other neonatal facility, you definitely must know and understand the concepts of Fetal Lung Development. So that is why we created this study guide to help you do just that. Are you ready to get started? 1. When does the pseudo glandular period occur? It is on the 5th to 16 weeks. Goblet cells appear in trach and bronchi. Mucous glands appear. 20 generations present by week 16. 2. What are the periods of fetal lung development? Embryonic, Pseudo glandular, Canalicular, and Terminal sac. 3. When does the first lung bud develop? By the 24th day in embryonic stage, as small buds from the esophagus. 4. When does the terminal sac period stage begin? 5. What time frame is considered post-natal alveolar period? Birth to 12 years (to around 200 million). 6. What develops or continues to develop during the post-natal alveolar period? 7. How many approximate alveoli is a baby born with? 8. In what (3) ways is fluid eliminated from the neonate’s lungs during childbirth? 1/3 squeezed out through birth canal, 1/3 removed by lymphatics, and 1/3 absorption by the pulmonary capillaries. 9. What is surface tension? It is the force present on the surface area of a liquid that tends to make surface area as small as possible. The mixture of phospholipids and proteins lines the alveolar walls. It is composed of 2 phospholipids: sphingomyelin and lecithin. 11. What is the purpose of surfactant? 12. What type of cells produces surfactant? 13. What happens in the placenta? The exchange of gases, nutrients, and wastes take place in the placenta. 14. How many arteries and veins are in the umbilical cord? There are 2 arteries and 1 vein. 15. What is the purpose of umbilical arteries? It carries de-oxygenated blood from the fetus to the placenta. 16. What is the purpose of umbilical veins? It carries oxygenated blood and nutrients from the placenta to the fetus. 17. What is the placenta PaO2? 18. What is the placenta PaCO2? 19. What is fetal PaO2? 20. What is the fetal PaCO2? 21. Why is there a difference between maternal O2 and fetal O2? The shunting in the placenta, metabolizing O2 in the placenta, and permeability membrane of gas exchange areas of the placenta. It is the alveoli in lungs are readily acceptable of volume & gas exchange. 23. How long and thick is the placenta? It is 20 cm long and 2.5 cm (1 in) thick. 24. How many segments are in the placenta? 25. How is fetal waste and oxygen transferred? 26. What is the maternal PO2? 27. What is the maternal PCO2? 28. How does O2 transfer from maternal to fetal blood? Maternal-fetal PO2 gradient which gas moves from high to low pressure, higher hemoglobin and greater affinity (magnet). 29. Define (FRC) Functional Residual Capacity? The capacity the baby lungs are partially inflated at birth. Fluid originates from alveolar cells during fetal development. At birth, fluid is removed during the first 24 hours by 3 ways. 30. What is a newborn’s lung compliance? 31. What is a newborn’s airway resistance? 30 cm H2O/ L/ sec. 32. How many babies born between 26-28 weeks develop RDS? 33. How many babies born between 30-31 weeks develop RDS? 34. What is the procedure used to diagnose fetal abnormalities? 35. What can amniocentesis reveal? Lung maturity, bilirubin level, creatinine level (kidney function), genetic disorders, and presence of meconium. 36. Why are there so many death occurrences if the baby is premature and a decrease in the prevalence of deaths the closer you get to term? The respiratory system is very slow to mature so it needs to be close to term to have a better chance of survival. 37. What is the path of air? From nose/mouth to pharynx then to larynx and trachea to primary bronchi and secondary bronchi to bronchioles then ducts to alveolar sacs and alveoli (gas exchange). 38. What are the 2 types of cells in alveoli? Type I and Type II. 39. What are the Type I cells? It makes up the alveolar wall and it functions in gas exchange. 40. What are Type II cells? It makes lamellar bodies which produce surfactant and line the alveoli. 41. What are the 3 zones of the lung? 42. What is the conducting zone? It includes the pharynx, larynx, and trachea which is the area that conducts gas to and from the lungs. 43. What is the respiratory zone? This includes the alveoli where gases are exchanged. 44. What is the transitional zone? It is in between conducting and respiratory zones. 45. When is surfactant initially secreted? At 25 weeks and then there’s increasing amount as it gets closer to term. 46. What are the 5 stages of lung development? Embryonic, pseudo glandular, canalicular, saccular, and alveolar stage/alveologenesis. 47. What happens in 37-38 weeks gestation? The interstitial layer gets thin. 48. How would you describe immature lungs? It has smaller alveolar area. 49. What can be adjusted to help premature infants and their respiration? 50. How is the surfactant production in the premature infant? 51. Why is poor surfactant production a problem? It is because mucus is high in water content. High water content has high surface tension, so the alveoli are trying to pull themselves closed and they will collapse. Surfactant usually breaks these polar bonds to allow lungs to remain inflated. Surfactant allows alveoli to maintain the alveolar shape. 52. What are some treatments for immature babies and their respiratory system? Supplemental oxygen to drive diffusion for respiration. Synthetic surfactant from calf lungs which help the alveoli maintain their shape, so they don’t collapse. Also, put on mechanical ventilation that can be very taxing on lungs and can have detrimental effects long term. 53. What is the result of bronchopulmonary dysplasia? 54. What is the treatment for bronchopulmonary dysplasia? Low-pressure ventilation systems, bronchodilators, and steroids. 55. What are the phases of fetal lung development? 56. Initial lung bud emerges from what? 57. The bronchial tree is formed at which gestation phase of lung development? 58. What are the minimal developmental features required for an immature human fetus to survive outside the uterus? Enough alveolar and vascular surface area for gas exchange, 22 to 24 weeks gestation, and near completion of the canalicular stage of lung development. 59. What do investigators agree with the estimates of the exact number of alveoli at birth vary widely? Gas exchange surface area grows proportionally with an increase in oxygen consumption and body surface area. 60. Which is the lung development stage formerly thought to be the last stage before birth, and characterized by relatively smooth-walled, cylindrical structures subdivided by ridges known as secondary crests? 61. What are the several clinical associations with regards to pulmonary hypoplasia is a relatively common abnormality of lung development? Lung tissue compression, oligohydramnios, and maternal diabetes. 62. What are the statements that represent Reid’s laws in human lung development? The bronchial tree develops by week 16 of intrauterine life. Preacinar vasculature develops after the airway has been established, and intra-acinar vasculature develops after the alveoli are generated. And the esophageal lung bud arises from the embryonic mesoderm to form the tracheal bronchial tree. 63. How are lungs and kidneys similar? Both develop via branching morphogenesis. 64. Where do lungs arise from? 65. Does lung development stop at birth? 66. What is the first phase? 67. How do the lungs start in the embryonic phase? The outgrowth of the foregut, the simple epithelial tubes branch out into mesenchyme or connective tissue. 68. What happens during the embryonic phase? Laryngotracheal tube forms buds into 2 bronchi with unequal budding (3 left lobes, 2 right). Subsequent division, bronchi + bronchioles. 69. What are lobar bronchi? The diverticula which is the budding of the bronchioles. 70. Where does most of the division take place? Fetus and further secondary septation can occur in adults. 71. What determines the differentiation of the developing respiratory tube? Regional specificity of the mesenchyme. 72. How does the respiratory epithelium develop? Neck grows straight to form the trachea and entering thorax is the branches to form bronchi and lungs. 73. What is the second stage? 74. What happens during the pseudoglandular stage? Epithelial cells invade further into mesenchyme and signals from mesenchyme stimulate budding and new outgrowth. 75. What is contained within the mesenchyme by the second stage? 76. What coincides with the development of pulmonary vasculature in the second stage? Rapid growth and proliferation of primitive airways. 77. What type of epithelium is present during stage 2? 78. When do initial respiratory ducts form? 79. What is the 3rd stage? 80. What do canaliculi branch out of? 81. What are the canaliculi? Respiratory part of the lungs. 82. Where do air spaces derive from and what do they form? Terminal bronchioles and it form an acinus. 83. What is the key part of the canicular phase? Alteration of epithelium and invasion of capillaries into the mesenchyme. 84. What happens to tubule lumens during stage 3? 85. How do epithelial cells change in stage 3? 86. When do the respiratory bronchioles form? 87. What happens to lung volume in stage 3? It increases and expansion of the air spaces. 88. Between stage 3 and 4, is there any differentiation of cells? Into type I and type II pneumocytes (alveolar cells). 89. What is the difference between type I and type II pneumocytes? Type I is flat and make up diffusion surface while Type II is round and contain surfactant. 90. When does the airway epithelium start to secrete lung fluid? When type II cells produce surfactant. 91. When do capillaries start to organize themselves into a double layered network around epithelial tubes? In-between stage 3 and 4. 92. What is the 4th stage? 93. Where do sacs/saccules form? 94. What do the sacs/saccules become? Alveolar ducts and sacs are coated with Type I and II pneumocytes. 95. What type of tissue starts to appear in the sacs during the saccular stage? 96. What promotes the last stage of differentiation? 97. When is the end of the saccular stage? 98. When do sacculi develop into alveoli? Around the end of pregnancy or after birth. 99. What is the last stage called? 100. How many of the alveoli are fully developed, but immature at birth? 101. What happens to the lungs in the alveolar stage? There is an increase in SA and vascular maturation. 102. When does the double capillary network in the alveolar wall remodel to a singular layer? 103. What does the ECM influence in the alveolar stage? The outgrowth of the secondary septa. 104. What is the ECM made up of? It is made of collagen, elastin, and proteoglycans. 105. What is the function of the ECM? It is the structural support and influences cell division, differentiation and migration. 106. What does the development of the secondary septa do? Thins out interstitial tissue layer and decrease diffusion distance for gas exchange. 107. What happens in the last stage after birth? Alveoli grow, subdivide the sacculi into smaller subunits (alveoli). 108. What do surrounding elastic fibers form? Interstitial septa between two capillary nets. 109. When does the number of alveoli increase rapidly and what is it called? Also, how long does it continue? It is in the first 6 months which is called alveolarization. It will continue for 18 months. 110. What limits the growth of alveoli? 111. What are the main factors influencing lung development? oligohydramnios, and lack of amniotic fluid can impair intra-uterine space due to compression. 112. What occurs during ‘practice’ breathing? Before the fetus is born, there’s regular activation of the respiratory mm. It has a little change in lung volume. 113. When is lung liquid produced? 114. What is lung liquid? The secretory product of pulmonary epithelium. 115. What can decrease the intra-thoracic space? 116. What is a common cause of pulmonary hypoplasia? 117. Is secretion of lung liquid active or passive? 118. What is needed for secretion of lung liquid? 119. Cl ions are moved across the epithelium into the lumen, what does this draw into the epithelium from the ISF? Sodium ions cause an osmotic grad for water to follow via the paracellular route. 120. How does Cl can take up on the basolateral membrane? Na/K/2Cl cotransporter, termed secondary active transport. 121. Is the movement of more Cl across the apical membrane into the lumen active or passive? 122. Why does lung volume increase with gestational age? Secretion increases with pulmonary SA. 123. Why is fluid secretion into the lungs needed? It promotes lung growth, keeps the lungs debris free, and supports amniotic fluid volume. 124. What is the most important function of lung liquid? 125. Are changes in lung volume induced locally or generally? 126. What stimulates cAMP second messenger system to increase expression of Na channels on the apical surface of the epithelium? 127. What does the pulmonary epithelium switch to after having been induced by cAMP? From Cl secreting membrane to Na absorbing membrane. 128. What are the functions of surfactant? Decrease surface tension, increase lung compliance, decrease work of breathing and stabilizes lungs. 129. What is the composition of surfactant? It is composed of 90% lipid (dipalmitoyl phosphatidylcholine) and 10% protein. 130. What controls surfactant production? Glucocorticoids, catecholamines (epinephrine), thyroid hormones, and mechanical stretch. And that wraps up our study guide on Fetal Lung Development. 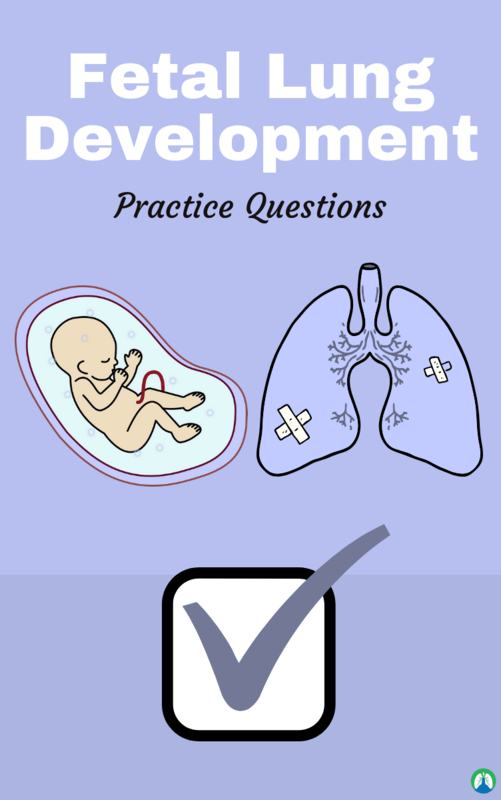 If you go through these practice questions a few times, you will easily develop the knowledge you need to truly know and understand Fetal Lung Development. So for those who wants to work with babies and kids someday, this information is especially crucial for you. Thank you so much for reading and as always, breathe easy my friend.